OK, Karen had spoke with her mother, Holly and Drew that morning prior to going to work and we haven't heard from any of these people. Who gave the description of the clothing Holly was wearing? At what time did Karen last see her daughter? What time did Karen leave for work? I know Parsons is close by and only about 12-15 min. away to the best of my kge, I assume karen worked in Parsons..seems like everyone did. First 911 call came in @ 7:59am according to Sheriff Wyatt. Some say there were FOUR calls...I wonder when they were received. Why hasn't tape of 911 been released? Sometimes 911 tapes aren't released because it's an ongoing investigation. Clint cannot keept his story correct for a 20 minute interview. When his contradictions in the JVM interview are considered ... it makes sense that there have been no more afforded interviews by the Bobos. C. BOBO: I saw the silhouette of two people in our garage. At the time I HAD NO IDEA WHO EITHER ONE OF THE PEOPLE WERE. C. BOBO: No, I assumed -- I was inside the house and I ASSUME THAT THAT WAS HOLLY AND HER BOYFRIEND DREW and he was dressed in full camouflage so I thought that Drew had been to the woods and killed a turkey and brought it back to the house and the two were sitting there over the turkey talking. PARSONS, TN (WSMV) - Inside Holly Bobo's home, Holly's mother Karen Bobo starts each day the same way, with a call to the TBI. "I call every day and ask 'is there anything you can tell me today,'" Bobo said. For the last two months, she's been getting the same reply. "Of course their answer is not today. We're just not hearing anything and of course almost six months into it just gets more frustrating every day and harder every day," Bobo said. That's not the only thing frustrating the Bobo's. First there are the constant rumors, calls and visits from psychics claiming they have answers, and even friends wanting to help. "I do kind of get in these panic attacks when I have to leave the house. Being out in public and thinking everybody is looking at me," she said. Perhaps worst of all, Bobo said, are the vicious accusations against Holly's younger brother Clint Bobo. "They don't know all the facts because, if they knew the facts, they would not be pointing the finger," Bobo said. In fact, Bobo thinks that's what Holly's country singer cousin, Whitney Duncan, was tweeting about when she recently expressed anger with investigators. "Any time anybody speaks negatively about Clint, Whitney is extremely defensive toward that," Bobo said. Duncan later took the comment down and tweeted she was "frustrated as you can imagine any family would be." Bobo said they'll stay that way until today ends and tomorrow investigators bring new answers. "I want that day to hurry up and get over so that the next day can roll around and I can ask them 'anything you can tell me today?' hoping one day that there will be something. It will not go away until Holly is home with us," she said. Recently community members planned a "birthday bash" for Holly's upcoming 21st birthday. Family members got wind of it and nipped it in the bud. They said they don't want to celebrate anything until Holly is back home. Bobo asked that anyone wishing to plan events or fundraisers contact the family first. There are those who claim that Clint had an altercation with the alleged abductor of his sister. The implication would be that inaccurate information was coming from the lips of TBI John Mehr in an official press conference as well as Clint in the JVM interview. Her brother, said Mehr,“had reasons to believe [the man] was not an attacker,” and did not call 911 until he saw blood outside. I have conducted an extensive google search and ... cannot find a media release or a press conference where Kristin Helms refutes the possibility that the alleged abduction of Holly Bobo is a hoax. Help! Anyways ... it would be helpful if Isabelle Zehnder had provided sources in her excellent timeline posted on her blog. Could it be that TBI believes that an abduction did not happen and are suspicious that the Bobo's as well as the elusive Drew have knowledge of the truth but ... without a body, confessions, evidence or witnesses ... the case has come to a standstill. 1. 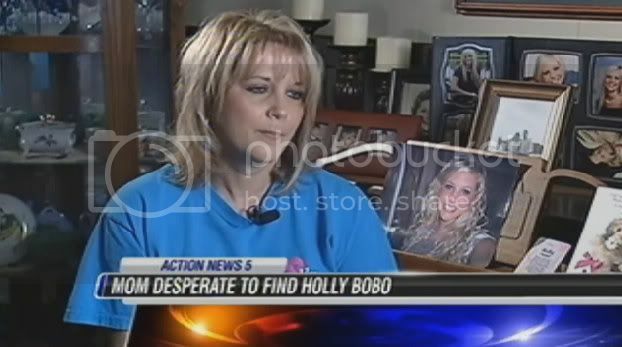 The official searches for Holly Bobo and the official media updates regarding the case ceased at Easter. Why. 2. On April 18th ... TBI director stated that the family was not ruled out as persons of interest in the disappearance of Holly Bobo..
3. There appears to have been a falling out between LE and the Bobo family. The day she went missing Bobo put on her bright pink shirt, jeans and black flip-flops and packed her lunch for another day of nursing school at the nearby UT-Martin campus. VELEZ-MITCHELL: What are the police or the Tennessee Bureau of Investigation -- what are authorities telling you? K. BOBO: The way I understand it, it`s a Tennessee law that actually the TBI doesn`t have to share any information with you as long as the case is ongoing, so we don`t receive much information at all. There appears to be a lack of communication both ways. Did the Bobo's and the elusive Drew lawyer up early on in the investigation ... maybe about the time that there was suspicion within the investigation pertaining to Clint. Why would TBI not identify the "significant find" that was found? The new evidence found during the search for Holly Bobo was her cell phone, found roadside on Hwy. 69. Although law enforcement are not revealing any information concerning the "significant" item found during Sunday's search, a member of the search teams has revealed the item was believed to be Holly's cell phone. Reportedly, the cell phone was located on side of the road on Hwy. 69 in Parsons, near Holly's father's place of employment, as well as Kolpack, a nearby factory, and the Tennessee Technology Center, where Holly was attending school. Decatur County Sheriff Roy Wyatt has related that law enforcement received a tip Sunday, April 24, 2011, which lead the investigation and search for Holly Bobo into Northern Decatur County. The Sheriff stated that a tip was received by phone, prompting a search of the area, during the late evening hours of Easter Sunday. In the course of the search, a new item was discovered, which law enforcement considered "significant", and apparently substantial enough for the Decatur County rescue squad and volunteer firefighters to be dispatched in order to perform a specialized foot search of the area. Law enforcement are not revealing any further information about the lead or the item found, at this time. I speculate that Dana and Karen are not providing untruthful answers in interviews but ... could it be that questions are controlled and ... questions that inquiring minds want answers to are not being asked. 1. Did Drew, Karen, Clint and Dana submit and pass polygraphs? 2. Did Karen and/or Clint attempt to contact Holly on her cell? 3. Did Clint attempt to assist his sister when he learned she was at risk? 4. Where where Holly, Clint, parents and the elusive Drew in the hours prior to Karen and Dana's departure from the home on the morning of April 30? 5. Who was the neighbour that contacted Karen at school and where does she live in relation to the Bobo home? 6. Why does there appear to be a falling out between the Bobos and LE? 7. Have Clint, Karen, Dana and the elusive Drew retained attorneys? Prior to calling 911 Karen has stated that following her "mother's intuition" that something was wrong in regards to the reported scream she called Clint ... she called Dana but ... nothing about calling Holly. At no time after learning that his sister may be at risk does Clint mention in interviews that he frantically attempted to contact Holly on her cell. He has never stated that in an attempt to catch up with his sister and her alleged abductor that he ran into the woods or jumped on his ATV. I would not have been able to hold my 13 year old grandson back if it was his 10 year old sister who was at risk. In other words this young man would have been more proactive than Holly's 25 year old brother. Has Drew, Clint, Karen or Dana submitted to and/or passed a polygraph. Think about it. Inquiring minds want to know but the polygraph issue has not been touch by hosts in any Bobo interview. Why? Think about it. Why did JVM not ask Karen the obvious question that inquiring minds want to know ... "Did you attempt to contact Holly?" VELEZ-MITCHELL: What about -- her cell phone was left at home? Considering I believe that Clint, Dana, Karen and the elusive Drew all have knowledge regarding the demise of Holly in the hours preceeding the dawn of April 13th ... I contend that Karen's early morning contact with Drew as well as her ongoing contact with this young man since has everything to do with keeping stories straight ... has everything to do with maintaining unity in a cover up. Now, four months later the heartache rages on.Holly's bedroom is filled with mementos that remind her parents of their only daughter. A pink teddy bear that holds the words, "Luv Ya," is on Holly's bed. It was a gift from her boyfriend, Drew. Karen said the 20-year-old is doing as well as can be expected. She said: "I text him every night, and he texts me back." NASHVILLE, TN (WSMV) - Police are investigating a body that was pulled from the Cumberland River downtown Friday night. Captain Taylor with Metro Police tells Channel 4 News that a fisherman called authorities after seeing what he thought was a body tangled up in fishing line. Police and the Fire Department responded to mile marker 185, which is near Riverfront Park to find the decomposed body. Captain Taylor says they were unable to identify the body's race or gender, and the body will be sent off for an autopsy. Page created in 2.161 seconds with 21 queries.